Thursday 15th November marked the date of the annual Ulidia Parent Council Christmas Fair. It was great to see such a variety of local craft stalls selling everything from vegan lip balms to art and jewellery. There were also a number of food stalls selling cupcakes, sweets, homemade jams and chutneys, candy floss and of course a favourite with the kids (big and small!) – hot chocolate crepes, courtesy of ‘Flippin’ Crepes’. Pupils joined the local craft producers this year, selling items and encouraging the crowds to take parts in activities to support their studies in Horticulture and LLW. In addition to this the choir sang carols whilst customers enjoyed Christmas refreshments with all proceeds going towards the Children’s Hospice. 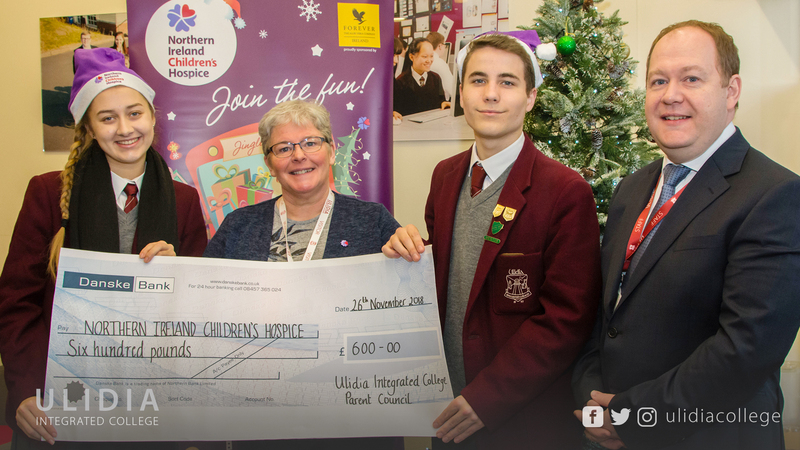 We were delighted to present a cheque for £600 to Catherine O’Hara, Regional Fundraiser for the local Children’s Hospice in Newtownabbey. This will go towards many hours of respite for families who most need the support of Horizon House this Christmas. Thank you for your donations and support for this worthwhile cause.